Organized Retail Crime is traditionally made up of two groups, the booster and the fence. In the past, the fence has operated "stores" out of their homes, flea markets, or street corners. However, eFencing has been on the rise in recent years. With the popularity and anonymity of online auction sites, such as eBay and Craigslist, e-fencing has become an attractive quality in fencing stolen merchandise. Another bonus to eFencing is that you can ask more for the stolen merchandise. Typically these sites will ask 70% of the retail value for stolen items vs. 30% for traditional brick and mortar locations. The Macy’s ORC team has been actively investigating different fencing locations including eFencing sites. Macy’s sells private brands which are exclusive to Macy’s. While researching one of the high shortage private brands, International Concepts or INC, being sold on eBay, an investigation was initiated into an eBay account selling INC merchandise in excess of $110,000. This seller used the user id "illdevilinc." Using their access to eBay's Proact system, Macy's East Coast ORC Manager was able to obtain seller’s personal information in order to further the investigation. It was determined that the seller lived in San Leandro, Calif. The listed seller was a 19-year-old male. The ORC team utilized Macy’s investigative systems to ensure he wasn’t an associate or had not been apprehended in the past. They also utilized internet public searches and social media to research the seller. It was determined that the male subject lived with three other people, assumed to be his mother and grandparents. It was determined that surveillance was the next step in the case. The West Coast ORC Manager traveled to the suspect’s home residence to conduct surveillance on the seller’s residence. During surveillance, two female subjects were observed leaving the residence. 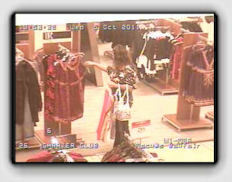 They were followed to the Macy’s store located in San Leandro. The East ORC Manager notified the store of the women’s presence and observation was begun utilizing the store’s CCTV system. The women were observed entering the INC department and immediately began selecting multiple pieces of INC merchandise. One suspect entered a fitting room with large amounts of INC, while the other brought her more merchandise. Store LP assisted in the fitting room surveillance. After an hour, both suspects departed the store. Multiple pieces of INC clothing were missing and unaccounted for from the fitting room. The ORC Manager followed the women back to the residence. At this time, it was determined that the eBay seller was the Mother of the person listed on the eBay account. The ORC Manager performed several observations over the course of two months with the same results. The ORC Manager monitored the seller’s eBay site and verified that items missing during surveillance were being posted for sale on the site. 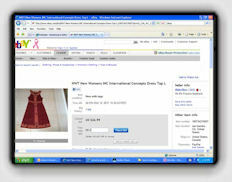 The West ORC Manager then conducted a controlled undercover purchase of several INC items from the sellers eBay site. When the packages arrived on the East Coast, they were able to confirm that the items they purchased were indeed the same items the suspect was observed selecting and entering the fitting room with. The packaging also confirmed the seller’s address, and name of the suspect under surveillance. Further investigation revealed that this suspect had been arrested for shoplifting on several other occasions at multiple retailers. In partnership with local law enforcement, detectives from the San Leandro County Police Department were contacted and presented with the evidence from the surveillance and purchases. A short time later, Detectives from San Leandro County PD and the two ORC Managers executed a search warrant on the sellers’ residence. 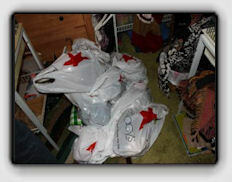 Over 200 pieces of stolen Macy’s private brand merchandise was recovered totaling over $10,000. Based on admission, the suspect listed these items at 30%-35% off the retail value. The total case value based on the admission and recovery is estimated $300,000 dollars. Suspect was arrested and is pending trial.